The damaged pick-up truck used by the Slovak tourists and driven by Annissa. 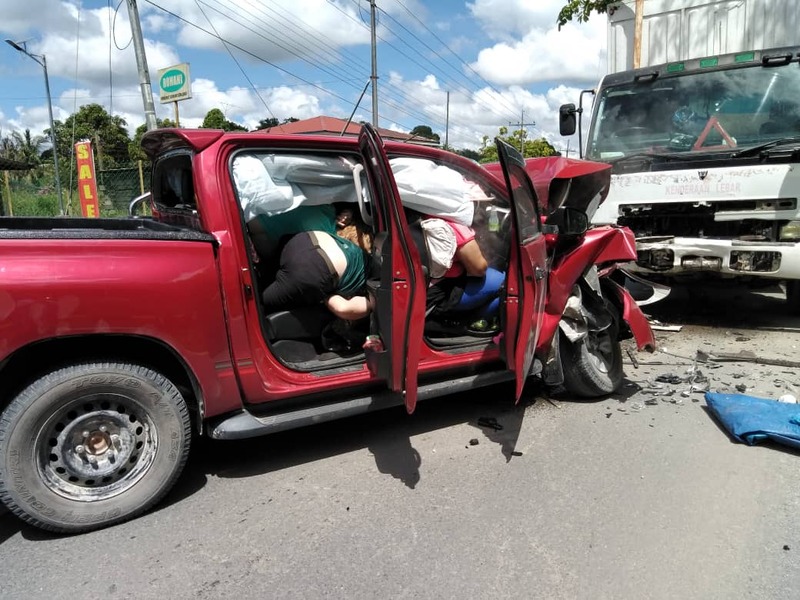 LIMBANG: A head on collision between a pick-up truck and a lorry container at 11:19am today has left a Slovak tourist and a local woman both dead, and three others seriously injured. Limbang District Police Chief Mohd Bukhori Saffai said the dead were identified as 71-year old Jaros and27-year old Annissa Saksriprapa Nantharat Sunan who is the wifeof Malaysias national Paralympic athlete, Jamery Siga. Both of the deceased were seated in the front of the pick-up truck during the time of the accident, with Annissa driving. The accident occurred at kilometre 6 near Kampung Batu Bakarang where the party were making their way from Kubong to Limbang Town. During the trip, the party had lostcontrol of the vehicle and skidded into the oncoming lane where the truck collided head on with an oncoming lorry container that was heading to Kubong. According to Bukhori, the two deceased were pinned in their vehicle upon impact and had died on the spot. The other three injured parties were were also Slovak tourists – a man, 57 and two women aged 51 and 61. They are currently in Limbang Hospital receiving treatment. Previously, the four Slovak tourists had stayed overnight at a homestay in Kuala Mendalam before returning back to Limbang Town. Bukhori guided that the case is currently being investigated under Section 41 (1) of the Road Transport Act 1987.